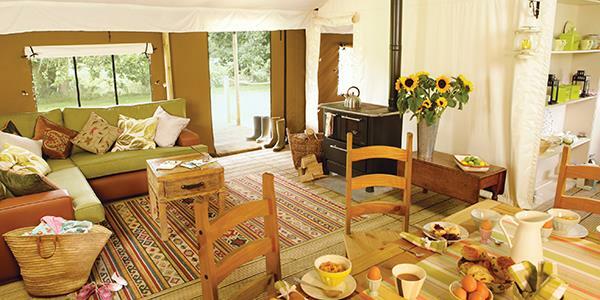 Thinking of going glamping? 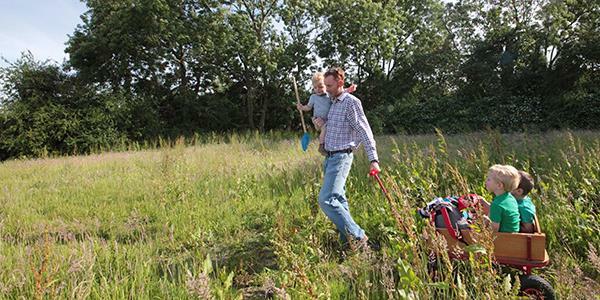 Why not try a mini break over the weekend? 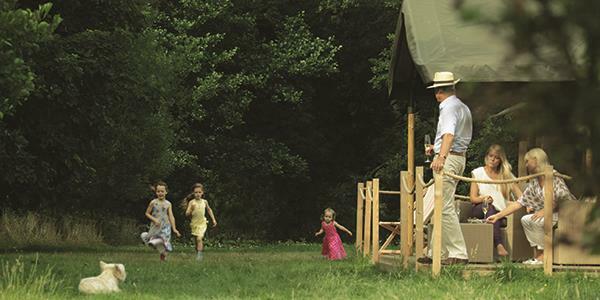 Here are six fantastic reasons why a weekend glamping trip is perfect for you. It doesn't matter if you work, you're retired or you're confined to term times, the majority of people have weekends free. So make the most of them! Get away from it all. Gather everyone you love and spend two glorious days in the countryside. The weekends should be all about you. Forget about work or the stresses of life. Just chill out somewhere beautiful. When you return on Monday all fresh-faced and beautiful, you'll be thanking us! There's nothing like breathing fresh air and leaving the city behind for a while to brighten your spirits and lift your mood. Fresh air, exercise and a break from screens. No one can argue with that logic! You won't be able to glue yourself to your mobiles and tablets whilst you're here because there's no signal, no wifi and no electricity. We're taking you back to basics for your own good, and your own peace of mind! Instead, you get to spend quality time laughing and chatting with loved ones, eating wholesome meals, romping about on long walks and soaking up the glories of the British countryside – whether that be meeting the friendly, neighbouring sheep, enjoying perfect scenery or simply taking advantage of the darker skies and those incredible far-reaching stars. There's a firepit too, so sitting outside in the evenings won't be an issue. That's right, this mini break will make things as easy as absolutely possible for you. Two nights away means you can jump in the car straight after work or school on the Friday and spend the weekend in peace. Because everything is there, ready and waiting for you in the glamping tents, you don't need to think about packing a whole carload of things. 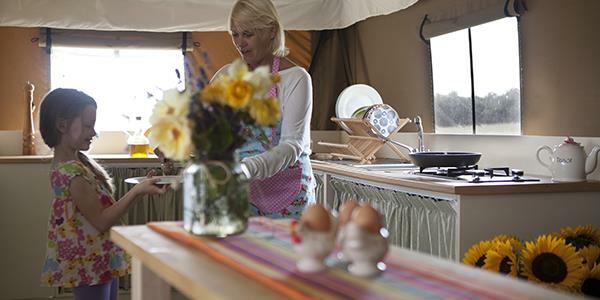 We've got your bedding, utensils, kitchenware and cooking facilities all sorted. This isn't camping in the traditional sense – there's no need to over do it on the packing front! In the tent there will be a log burner which can double as a stove, there'll be a gas hob and a kettle. Outside the firepit doubles as a barbecue. 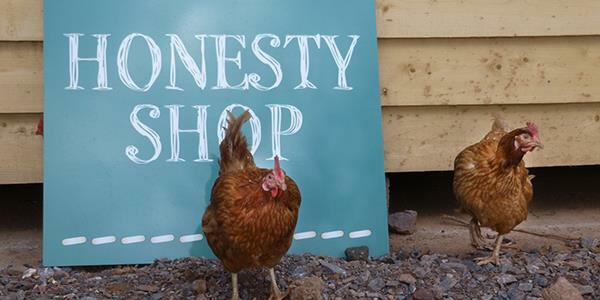 On site you'll find an honesty shop for the real essentials, but if you don't want to think about buying Friday's evening meal, why not order one of our food packs to be waiting for you upon your arrival? Simple! At Lantern & Larks we feel that a weekend can sometimes be just the perfect amount of time to be away. Though we don't like to think about work too much on holiday, there is always that worry that you'll return to mountains to catch up on! If you're gone for a whole week you might have to sort out pets, house-sitters or garden-waterers. For a weekend break you needn't worry. Monday will be the same as every other Monday and I'm sure a kindly neighbour will pop in to put some cat food down for the moggy on Saturday morning. 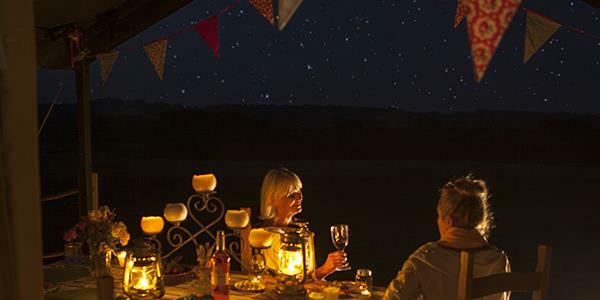 It's called 'glamping' (glamorous-camping) for a reason. It may be in the countryside, but it's still luxurious. This isn't the kind of camping you picture with wash blocks and muddy toilets. Oh no. This 'tent' is your own little canvas haven: fully furnished, real bedrooms, living room, hot running water, a toilet and shower. There's an outdoor decking with furniture and spacious surroundings. You'll be relaxing in true style. Alternatively take a look at our full availability and book your holiday here.